The Anglo–Powhatan Wars were three wars fought between English settlers of the Virginia Colony, and Algonquin of the Powhatan Confederacy in the early seventeenth century. The First War started in 1610, and ended in a peace settlement in 1614. Another war between the two powers lasted from 1622 to 1626. The third war lasted from 1644 until 1646, and ended when Opechancanough was captured and killed. That war resulted in a boundary being defined between the Indians and English lands that could only be crossed for official business with a special pass. This situation would last until 1677 and the Treaty of Middle Plantation, which established Indian reservations following Bacon's Rebellion. Complications with natives typically resulted at most of the settlements the English tried to establish from the beginning. The failed Roanoke colony marked the first contact between English settlers and Algonquian coastal tribes in North Carolina. "As early as 1585 an elder by the name of Richard Hakluyt bluntly stated the English Position for the new colony: The ends of they voyage [to America] are these: 1.to plant Christian religion 2.to Trafficke 3.to conquer". The first permanent English settlement, Jamestown, Virginia (May 1607), was within the territory of the powerful yet still expanding chiefdom of Wahunsunacawh (known to the English as Chief Powhatan). The Jamestown location was less than successful, because the conditions of this swampy area were far less than desirable, including: polluted water, significant amount of insects that carried disease, and soon, the lack of food supply. Jamestown, and the other colonies to be established in the "New World" were dependent on natives for a successful settlement. Unable to trade with the natives, the English began to starve to death, to the point that when Sir Thomas Gates arrived in late May 1610, he decided to evacuate Jamestown. However, on their second day of sailing, they met Lord de la Warr (Francis West's older brother) coming into the Bay with the remnant of his fleet, which had left England one year earlier, but been scattered in a hurricane. They therefore returned to the fort under de la Warr's command. Around the time of Christmas 1611, Dale and his men seized the Appomattoc town at the mouth of their river, and quickly palisaded off the neck of land, renaming it 'New Bermudas'. The aged chief Powhatan made no major response to this English expansion, and he seems to have been losing effective control to his younger brother Opechancanough during this time, while the English consolidated their new footholds. In December 1612, Argall concluded peace with the Patawomeck; while there in April 1613, he managed to capture the great chief Powhatan's own daughter, Pocahontas, delivered into his hands by Japazaws, brother of the Patawomeck weroance. This caused an immediate ceasefire from the Powhatan raids on the English, as they held her ransom for peace. In the meantime, English settlers had begun to expand to south of the rivers, building houses at City Point in what is now Hopewell, Virginia. Peace negotiations stalled over return of captured hostages and arms for nearly a year; finally in March 1614, Dale went with Pocahontas (Matoaka) and a large force to find Powhatan himself. Getting a shower of arrows at present-day West Point, they went ashore and sacked the town; finding Powhatan at his new capital Matchcot. They finally concluded a peace that was sealed by the marriage of Pocahontas to the colonist John Rolfe. This was the first known inter-racial union in Virginia, and helped usher in a brief period of better relations between the Indians and the newcomers. A separate peace was concluded the same year with the autonomous Chickahominy tribe which even made them honorary "Englishmen," thus subjects of King James I. Following the 1614 marriage of Rolfe and Pocahontas, relative peace and good relations reigned for several years. This time has been called the "golden age of Powhatan-English relations, in English eyes." It has also been called the peace of Pocahontas. Following Chief Powhatan's death in 1618, his younger brother Opechancanough assumed full power, being their middle brother Opitchapam the new mamanatowick, and Nemattanew continued to be a prominent figure alongside him. In 1624 both sides were ready for a major battle; the Powhatans, Opitchapam leading their force, assembled 800 bowmen, arrayed against only 60 Englishmen, who attempted to destroy the Powhatans' cornfields. When the Englishmen finally succeeded in destroying the cornfields, the bowmen gave up the fight and retreated. 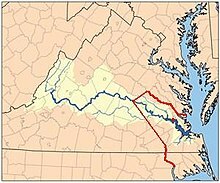 By 1634, a palisade (stockade) was completed across the Virginia Peninsula, which was about 6 miles (9.7 km) wide at that point between Queen's Creek which fed into the York River and Archer's Hope Creek, (since renamed College Creek) which fed into the James River. The new palisade provided some security from attacks by the Virginia Indians for colonists farming and fishing lower on the Peninsula from that point. After twelve years of peace following the Indian Wars of 1622-1632, another Anglo–Powhatan War began on April 18, 1644, as a last effort by the remnants of the Powhatan Confederacy, still under Opechancanough, to dislodge the English settlers of the Virginia Colony. 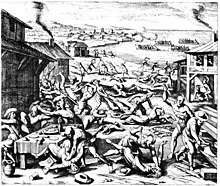 Around 400 colonists were killed, but that number represented a relatively low percent of the overall population, as opposed to the earlier massacre (the 1622 attack had wiped out a third; that of 1644 barely a tenth). However, Opechancanough, still preferring to use Powhatan tactics, did not make any major follow-up to this attack. The war's end ushered in 30 years of relative peace between the colonists and the Powhatan, shattered only by the attacks of Bacon's Rebellion in 1676. This resulted in the Treaty of Middle Plantation signed by Cockacoeske, Powhatan's matrilineal successor. The treaty set up reservations for each tribe, and allowed them hunting rights outside their reservations. It established that all the Indian rulers were equal, with the provision that the "Queen of Pomunky" was now owed the ancient subjection of several scattered groups of Indians. ^ "First Anglo-Powhatan War (1609–1614)". Encyclopedia Virginia. Retrieved 19 April 2017. ^ a b c Puglisi, Michael J. (1991). "Capt. John Smith, Pocahontas and a Clash of Cultures: A Case for the Ethnohistorical Perspective". The History Teacher. 25 (1): 97–103. JSTOR 494612. ^ Glenn, Keith (1944). "Captain John Smith and the Indians". Virginia Magazine of History and Biography. 52 (4): 228–248. JSTOR 4245316. ^ Helen Rountree, Pocahontas's People, p. 38. ^ Rountree 1990, p. 55n; she notes that while historians such as Fausz place the beginning in 1609, her 'emphasis on diplomatic relations' would rather date the outbreak of the full-fledged war to 1610. ^ Rountree, p. 80 n.
^ a b c Spencer C. Tucker; James R. Arnold; Roberta Wiener (30 September 2011). The Encyclopedia of North American Indian Wars, 1607–1890: A Political, Social, and Military History. ABC-CLIO. pp. 17–19. ISBN 978-1-85109-697-8. Retrieved 30 March 2013. ^ Rice, James Douglas. "Second Anglo-Powhatan War (1622–1632)." Encyclopedia Virginia. Virginia Foundation for the Humanities, 30 Nov. 2015. Web. 12 Oct. 2018. ^ William Waller Hening, editor, The Statutes at Large; Being a Collection of all the Laws of Virginia, from the First Session of the Legislature in the year 1619, 13 vols. (Richmond: Samuel Pleasants, Junior, 1809), vol. 1, page 290, "Act IV," 17 February 1644/5, "THAT the eighteenth day of April be yearly celebrated by thanksgivings for our deliverance from the hands of the Salvages. ", digital images, Internet Archive (https://archive.org : 2 April 2019). ^ Joseph Frank, editor, “News from Virginny, 1644,” The Virginia Magazine of History and Biography, vol. 65, no. 1, 1957, pp. 84–87, citing the Mercurius Civicus, No. 104 for the week of May 15-22, 1645, London; JSTOR, www.jstor.org/stable/4246282 : accessed 14 April 2019.